Oh my god Dom! Can you do one of mine too? That's amazing! That's so cool. I'm loving the softened edges, and the racy details. Great intrpetation. It's a base 1.4L, and has black trim and hubcaps. hey 2o6, that looks good. 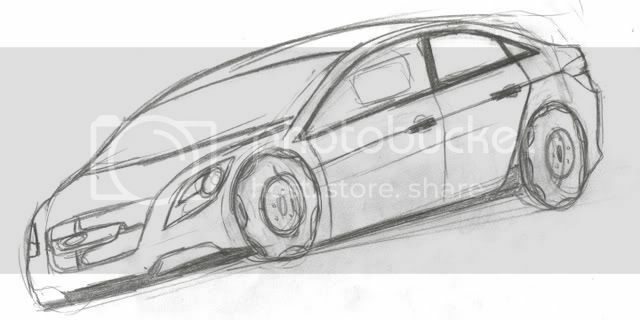 the front is definitely close to how i envisioned the icon, although it's maybe a bit low, and the sides actually come pretty close to the sedan blueprint i drew up back in 2003 (pre-facelift) and 2006 (i don't think i ever posted it though). there's actually no 3rd side window, however; it's a 2-port design, although your interpretation looks better. and domino, jeez, that's amazing. there's a clarity and energy and just a..."je ne sais quoi" type of thing to your drawings that i envy to no end and have never been able to match in my own sketches...and 2o6's design looks really spectacular, as well. i think i might try this; i drew a veloce minivan a while back just for the fun of it, though veloce doesn't seem to be around anymore (and i don't entirely remember what i did with the sketch...) so maybe i'll try sketching an aviva or a clarkman! Sure. Any of them in particular? I will also do my version of car soon. Okay, per NelsonDesign's request, I chose to reinterpret the Iridium concept he debuted at the Paris show. It's supposed to be an Aviva Cosmos competitor (which, IIRC, is in itself a CR-V sized crossover), so a smallish CUV. I retained all of the elements of the original sketch but also added some ideas of my own; it was a clean, relatively simple design upon which I simply wanted to impart a more unique identity. I tweaked the fascia, scultped the hood, and added flared arches; I also changed the proportions slightly to make it more CUV-like, and gave it some appropriately huge concept-like wheels :) Like the Aviva, I had fun doing this one; I hope it turned out okay. Hey Dom, I love your take on the Iridium. Very bold. I'd love to see your take on the original VW Climax.